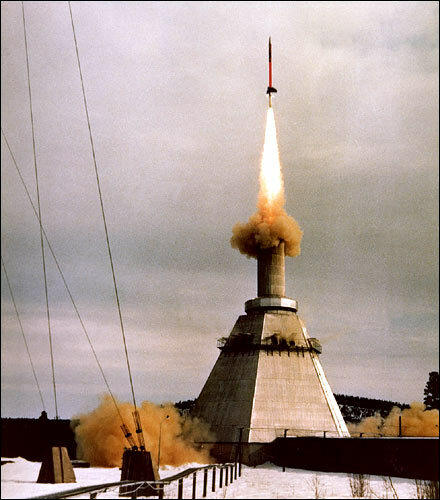 Launch of a Skylark 7 from Esrange in Sweden. Skylark is a British sounding rocket program that originated in 1955 when the UK Ministry of Supply announced that the Royal Aircraft Establishment and Rocket Propulsion Establishment would develop a rocket in time for the International Geophysical Year in 1957. The first Skylark was designed for economy, with no guidance system and launch towers built from spare parts of army bridges. Its maiden launch took place on February 13, 1957, from Woomera, Australia, followed by two test flights and then, in November 1957, the first operational mission carrying scientific experiments. Over the years different versions evolved. The first Skylark was capable of lifting 45 klograms to 150 kilometers; the final variant, the three-stage Skylark 12, could carry a 200 kilograms payload to 576 kilometers. The rocket went international, being used by ESRO (European Space Research Organisation) in 1964-72 and Germany from 1970. Although the British Skylark program ended in 1979, after 266 launches, and the rocket is no longer manufactured, enough of Skylark 7's remained in stock for ESA (European Space Agency) to continue launches of Britain's most successful rocket into the early part of the new century. The 441st and final launch, carrying the Maser 10 payload, was slated to take place from Esrange, the Swedish Space Corporations site near Kiruna, on May 1, 2005.